at the Emilio Aguinaldo College Futsal Gymnasium in Manila. 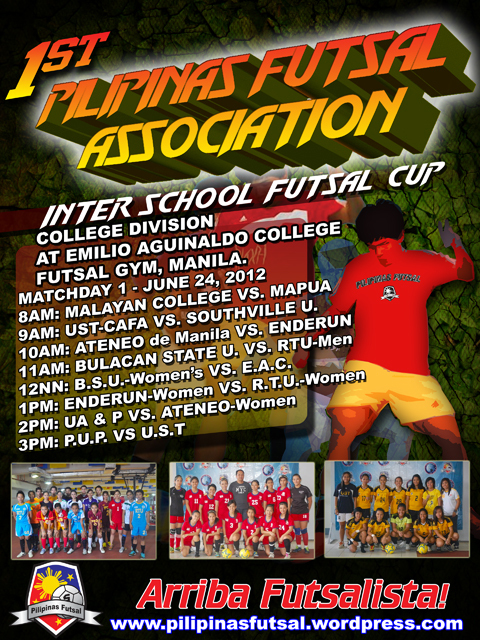 We will have our Coaches Meeting on June 17, 2012 (Sunday 2:00pm) at the 6th floor of the Emilio Aguinaldo College Gym. -Submission of the fully accomplished Tournament Registration Form & Waiver Form. -Payment of the Registration Fee. -Soft copy of the team picture, school logo, team logo, team mascot (if any) that will be used for the teams’ marketing materials.